(L-R): Professor Ellen Podgor with Professor Lucian E. Dervan, incoming ABA Criminal Justice Section chair. Photo by Cheryl Segal. 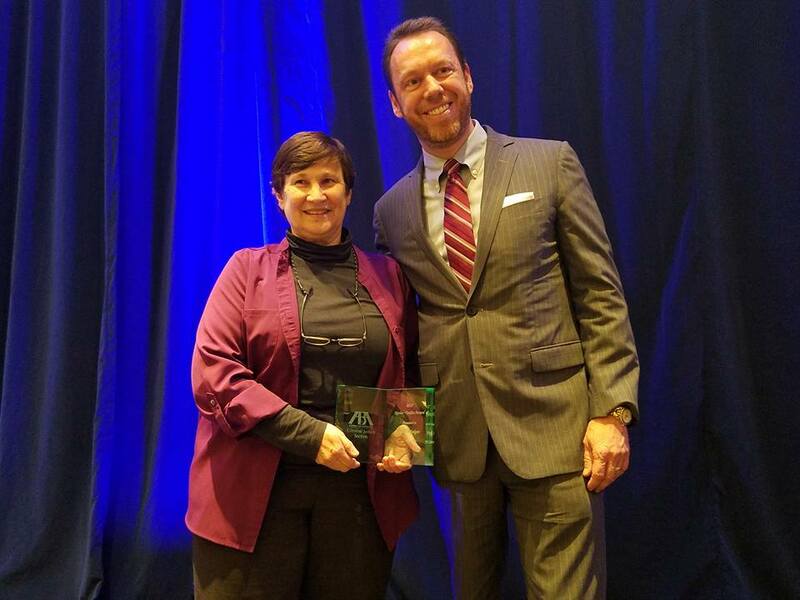 Stetson University Professor of Law Ellen S. Podgor received the American Bar Association Raeder-Taslitz Award on Nov. 3 in Washington, D.C. Podgor is the Gary R. Trombley Family White Collar Crime research professor at Stetson. The ABA Criminal Justice Section award recognizes a law professor who exemplifies ethical and professional conduct; demonstrates excellence in scholarship, teaching or community service; and has made a significant contribution to promoting public understanding of criminal justice, justice and fairness in the criminal justice system or best practices on the part of lawyers and judges. Professor Podgor is a former deputy prosecutor and criminal defense attorney who teaches in the areas of white collar crime, criminal law and criminal procedure adjudication at Stetson University. In 2010, she received the Robert C. Heeney Award, the highest honor given by the National Association of Criminal Defense Lawyers. She has co-authored books including White Collar Crime in a Nutshell, Understanding International Criminal Law, Mastering Criminal Law, White Collar Crime Hornbook, and Mastering Criminal Procedure Vol. I and Vol. II. She authored more than 70 law review articles and essays on computer crime, international criminal law, lawyer’s ethics, criminal discovery, prosecutorial discretion, corporate criminality, and other white collar crime topics. Professor Podgor annually works to facilitate the NACDL White Collar Criminal Defense College at Stetson, which teaches practitioners and those new to white collar criminal defense key advocacy skills while learning substantive white collar crime law from masters in the field. The Raeder-Taslitz Award is given in memory of Professors Myrna Raeder and Andrew Taslitz. Raeder was a past chair of the Criminal Justice Section, a revered professor at Southwestern Law School, and a passionate advocate for recognition of the special needs of women in the criminal justice system. Taslitz was chair-elect of the Criminal Justice Section, and an esteemed member of the Howard Law School faculty for 23 years before joining the Washington College of Law at American University in 2012.